Have feedback? We’d like to hear from you. Write me at:[email protected]. NEW YORK-PRESBYTERIAN, WALGREENS PARTNER FOR TELEMEDICINE: A partnership between New York-Presbyterian (NYP) and Walgreens is pushing telemedicine further into the mainstream. NYP announced Monday that its physicians will be accessible remotely for non-life-threatening illnesses through Walgreens’ online portal and self-service kiosks at select Walgreen-owned Duane Reade locations in New York. The partnership is an expansion of NYP’s OnDemand platform for telehealth and mHealth services, which was launched in 2016. 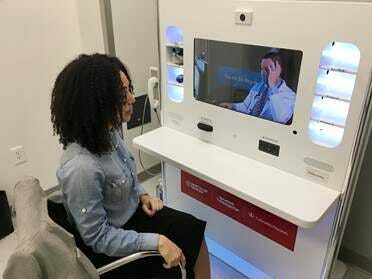 For $US99 per session, patients can visit secure, private kiosks to be examined by doctors via video chat. The kiosks are also fitted with connected devices for examinations, including blood pressure cuffs, forehead thermometers, and dermascopes. Doctors can also send prescriptions to the patient’s preferred pharmacy. The service was initially being trialed as a way to triage emergency patients visiting hospitals in NYP’s network.Since its introduction, the service has shown incremental reductions in the average amount of time spent in emergency rooms, according to NYP chief transformation officer Dr. Peter Fleischut. NYP and Walgreens are the latest among a number hospitals and pharmacies offering similar telemedicine services.Hospital networks are using these telemedicine services to increase their points of contact, add network reach, and grow their brand name. BayCare Health System, based in Florida, partnered with Publix supermarkets in October 2017. The two companies plan to open 25 telehealth clinics at select Publix supermarket pharmacies within the next two years. CVS Health and the Cleveland Clinic launched a similar service, called “MinuteClinics,” in Ohio in April 2016 and have been expanding ever since – as of December 4, there are more than 1,100 MinuteClinic locations. This isn’t Walgreen’s first endeavour into telehealth, but it does signify an evolution and expansion of the company’s efforts. The pharmacy began working with MDLive to provide 24-hour access to US-board certified doctors in 2014. And in 2013, Walgreens’ launched Pharmacy Chat, giving customers the ability to reach Walgreen Pharmacists around the clock. The latest addition means that patients can use Walgreens as a full end-to-end doctor visit, increasing the time and frequency customers are spending in-store. PATIENT DATA CONTINUES TO BE A TARGET OF CRIMINALS: Health data breaches have become an increasingly common occurrence in the healthcare industry. The sensitive nature of patient data collected by healthcare providers, which could include names, addresses, social security numbers, payment information, and health records, has made it an appealing target for cybercriminals. Just recently, the University of North CarolinaHealth Care’s Dermatology and Skin Cancer Center, the Pulmonary Specialists of Louisville, and New Jersey’s Hackensack Sleep and Pulmonary Center all reported breaches that may have compromised over 72,000 patient records. Moreover, 83% of US physicians have reportedly experienced some form of a cybersecurity attack, according to a new survey released by Accenture and the American Medical Association (AMA). If providers want to curtail these cyber attacks they must move beyond just complying with HIPAA safety standards, instead, they must proactively invest in the most up to date security technology and constantly educate staff on new processes. PHILIPS ADDS TO ITS POPULATION MANAGEMENT PORTFOLIO WITH LATEST ACQUISITION: Technology company Philips has acquired VitalHealth, the provider of a cloud-based population health management solution, for an undisclosed sum,according to WebWire. VitalHealth has developed several tools, including a portfolio of telehealth apps and a care coordination platform, to improve patient engagement, care coordination, and analytics for more than 100 healthcare networks that use its services. For Philips, this follows the 2016 acquisition of population health management solution provider Wellcentive, which gave the firm access to an informatics platform that enabled networks to improve the way they aggregated and analysed data across health systems. The combination of these portfolios will give Philips the ability to offer stronger solutions for managing patient populations and in turn, capture a piece of a growing market – the population health management market is expected to reach $US42.5 billion by 2021 from $US13.9 billion in 2016, according to MarketsandMarkets. NOKIA AIMS TO GIVE CONSUMERS MORE CONTROL OVER THEIR HEALTH DATA: Nokia plans to use blockchain to improve consumers’ level of trust in managing health data, according to the company’s blog. The communications giant partnered with OP Financial Group, a financial services group based in Finland, to launch a pilot to “explore new opportunities” in digital health, which includes investigating ways blockchain can give consumers greater control over their health data, such as who can access it and how it can be used. The pilot will begin with 100 participants sharing daily steps and sleep data recorded by Nokia’s Steel HR, the company’s HR monitor smartwatch. That data will be shared with OP Financial via an app that’s been encrypted through the blockchain. Users will be rewarded based on achieving fitness goals. The two companies hope that the trial will demonstrate the viability of using the blockchain for health data, and assuage any fears consumers and businesses might have over the security and transparency of how and by whom this data is being accessed and used.